THE FSMA (FOOD SAFETY MODERNIZATION ACT) and FSVP (FOOD SUPPLIER VERIFICATION PROGRAM) IS THE LAW. VIOLATION CAN RESULT IN STOPPING YOUR SHIPMENTS AND MORE. FSMA provides tools to PREVENT food safety problems BEFORE they occur, rather than trying to identify and REACT to food safety hazards that have already occurred and addresses the safety of humans (and animal foods) from FARM to FORK. There are also provisions to prevent intentional contamination of food. FSMA encompasses seven (7) rules, each directed to a different industry. One company may fall under several industries. (For ex: I import Product A, pick them up and deliver to my customer, with my own trucks, process or just pack product at my facility.) These rules affect everything in the supply chain, not only produce. to both foreign and domestic manufacturers/processors and others. Efforts to protect foods from farm to table by keeping them safe from contamination during transportation. The goal of this rule is to prevent practices during transportation that create food safety risks, such as failure to properly refrigerate food, inadequate cleaning of vehicles between loads, and failure to properly protect food. The rule establishes requirements for shippers, loaders, carriers by motor or rail vehicle, and receivers involved in transporting human and animal food to use sanitary practices to ensure the safety of that food. During a Food Safety audit, the certifier stated that being a CTPAT (Customs Trade Partnership Against Terrorism) member was one piece of evidence to demonstrate that the food supplier was preventing and protecting against any sabotage or international adulteration. 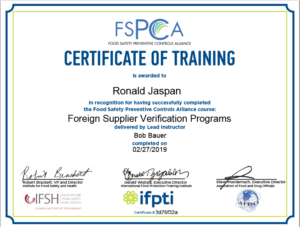 The Foreign Supplier Verification Program, or FSVP, which is one part (rule) of FSMA was published on November 27, 2015.This portion of FSMA deals with the requirements surrounding food safety of IMPORTED GOODS intended for human consumption in the US. Historically, the Food & Drug Administration (FDA) has been responsible for certifying imported foods and ensuring their safety through sampling and testing programs, supplier registrations and on-site audits. Now, the burden of assurance is being shifted to the importer. the same standards that the FDA requires from domestic food manufacturers. Evaluate the risk of the food and the food safety system that the supplier has in place. Food importers must have a written FSVP program and follow these written procedures for verifying the compliance of the foreign suppliers and correcting any known violations. A separate FSVP must be developed for each food item and each foreign supplier, even if it is the same food from different suppliers. All this must be done by a qualified individual. WHO IS THE FSVP IMPORTER? the food, has purchased the food, or has agreed in writing to purchase the food. It cannot be the Customs Broker. The FSVP Importer can but does NOT have to be the Importer of Record (“IOR”). The FSVP Importer can be a U.S. Agent or representative. WHAT HAPPENS IF I DO NOT HAVE A FSVP PROGRAM IN PLACE? means that the entry will be rejected. Prevent Importer from shipping food to their customer. FSVP importer’s food will be placed on an import ALERT. WHERE DO I BEGIN AND HOW DO I KNOW IF IT APPLIES TO ME? Develop a Foreign Supplier Verification Program for your business. We have incorporated the iVerify (Cloud Based Software System into the FSVP Program. See below. about the potential risks associated with the food they import and their suppliers. Prepare your company for a food safety audit. Be present for food safety audits. 3iVerify is a comprehensive and integrated Food Safety and Quality Management System with all the modules you need to operate an efficient, compliant food manufacturing, processing or importing business. It provides Supplier & Material Approval, Document Control, Corrective Actions & Management Alert and Reporting. EASY TO USE & NAVIGATE – Interactive dashboard that allows you to quickly navigate to where you need to go to complete your tasks. CENTRALIZED DOCUMENTS - Risk assessments, procedures, records and approvals are in one location. Documents are approved by the right people within your organization and PCQI's oversite. Electronic documents are permission based to those that need access. SAVINGS - Save time by not having the back and forth emails that take weeks to get documents that are needed. Save money on a system that is affordable and save storage space in email and in your share drive by using a cloud based system. 100% AUDIT-READY – Your compliance can be audited in real time. You are able to respond to inquiries within minutes. Foreign Supplier Verification Program (FSVP) compliance is a problem which technology can solve cost effectively. Implementing FSVP manually is costly, time consuming and risky. US food importers may face financial loss through port detention and rejection, fines and prosecution. Food importers need an efficient way to record and access supplier food safety information so they demonstrate that their suppliers comply with US food safety laws, namely FSVP. Primority’s 3iVerify solution has been specifically developed to help provide an easy to use framework that takes care of all the inefficient processes of gathering and approving your suppliers and monitoring their performance. The purpose of FSVP is to ensure that your suppliers operate to the same food safety laws as US food producers. This is typically done via an on-site inspection of the foreign supplier or via a supplier approval questionnaire. NJA through 3iVerify solution provides the supplier approval questionnaires you need to do this in a time efficient and automated fashion, saving money and time. After the supplier completes this, then our “PCQI” reviews the information. FSVP also requires importers to carry out a hazard analysis on all food products imported to the USA. Importers must evaluate hazards and verify that the necessary controls are in place to prevent them. These activities can be implemented through a number of methods, e.g. on-site inspections, on line questionnaire, testing and sampling and review of food safety records. If you import a large number of food materials, then an effective system is critical to remain complaint on an ongoing basis. FSVP requires importers to monitor the performance of foreign suppliers. We want to ensure that the suppliers are not involved in food safety incidents and that they continue to control hazards effectively. Supplier monitoring means staying up to date with your supplier’s food safety status by regularly checking for FDA warnings or detentions and if the supplier is subject to food safety recalls or food poisoning outbreaks. 3iVerify solutions has built in tools that do the checking for you and alert you to any incidents that your suppliers are involved in. This helps ensure that you implement a proactive monitoring program that can easily be demonstrated to the FDA. It also helps you operate a more effective business. FSVP requires importers to keep records of corrections and corrective actions regarding suppliers and the food they supply. This ensures that the importer is proactively managing any issues that may become hazardous to US Consumers in line with US Food laws. Things can go wrong in any business. What is important is having a method for dealing with the issue and working things so that they do not happen again. 3iVerify solution has a built in corrective action module to facilitate the logging and action tracking of corrections and corrective actions. This provides an effective way to manage issues, monitor supplier performance and demonstrate FSVP compliance. Document procedures are required by FSVP. Documents must be maintained under document control and staff must be aware of and use approved and documented procedures. Document management and control is vital in any business where safety and quality are required. This means that a system must be in place for document control, approval acknowledgement and distribution. 3iVerify solution provides a comprehensive document control system that seamlessly handles document management and control. This enables staff to focus and collaborate on FSVP documented procedures and keep everything up to date, accurate and relevant. One is subject to the FSVP laws or exempt? Do any of these new FSMA rules, other than FSVP, apply to your company? Want to learn more about our food safety services? Contact us to learn about how Norman Jaspan Associates, Inc. can help your company determine if you are exempt from the FSVP laws or need to join and maintain the FSVP.